Watching TV is the world’s most popular pastime, and the latest Nielsen data shows that as of December 2009, Americans were watching more than ever before in history: 35 hours a week, to be precise. And, despite the economic downturn, we haven’t stopped buying televisions. In fact, we reached a record high in January, with an average of 2.93 TVs per household. 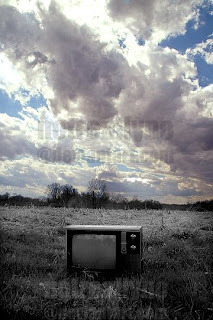 I'm not against the television, I don't want you to think that. I do like it - I think it can entertaining, a useful educational tool and a way to spend time together. But I also think there's a lot of bad stuff on it, it can distract us from other things and can enable us to be more lazy. I've seen both sides of the fence on this issue - I know some people that don't watch television at all and others that are obsessed. I myself am a person who has a few favorite shows but I don't watch very much "live" TV. DVR is my near and dear friend. Having kids, it's not always convenient (or sometimes appropriate) to watch television with them. So I set up the DVR to record my favorite shows and then watch them later, usually after the kids go to bed. I almost never watch television during the day, unless it's a kid's show. And speaking of kids - according to researchers, a 3 year old who watches two hours of TV per day is 20% more likely to have attention problems at age 7 than a child who watches no television. If my son (who is four, soon to be five) watches too much TV it makes him incredibly hyper and it seems like it's harder for him to pay attention. But wait before you chuck your television out the window...because other studies show preschoolers who watch high-quality educational television programs tend to score better on reading and math tests. I know that to be true - I've seen my son spelling and sounding out words along with the kids on Word World. There are a lot of good shows for kids on PBS (and other stations, I'm sure - we mainly just watch Boomerang and PBS) that teach kids about words, math, reading, science, etc. I think it's all about finding your happy medium. If you're okay with the time you spend watching TV and it's something that you enjoy, then it's probably okay. But if it's getting in the way of your relationships, taking care of your house, self or kids...then it's probably time to retire the TV for awhile or at least put some more limits on it. As far as kids go, I think if they don't watch too much and they do well watching it, then it's okay. So dear readers, I ask you - what's your policy on the television, for yourself and your children? Personally I don't like tv. I never did as a kid either. Reason being is people do not socialize when they watch tv. The turn into sombies.